Manage your business listings to rank higher everywhere online. and Yahoo so you’re found easily by search engines. 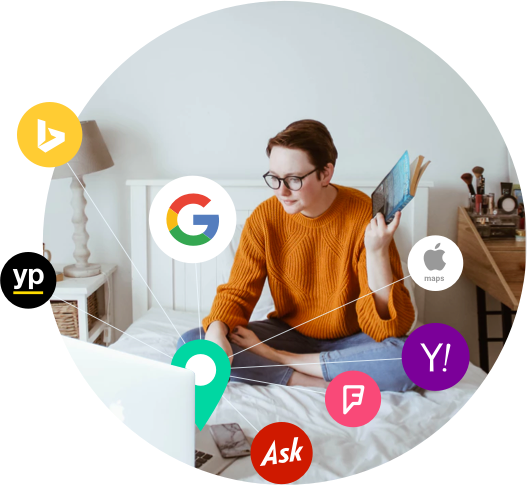 BirdEye automatically syncs any changes you make to your business listings (name, address, and phone number) for each location across 50+ global partners, including Google, Bing, Facebook, and Yahoo so you’re found easily by search engines. Make it count every time someone finds you on Search and Maps. It’s easy to keep your business listings fresh with images, videos, business hours, websites and more directly from your dashboard. Bring in customers by sharing helpful information and with BirdEye, all your great reviews are indexed by search engines. BirdEye’s free Scan Your Business tool gives you an overview report of your online performance: see your listings, reviews, ratings across 300+ sites, and how you stack up to competitors. With BirdEye, your online presence is not only fixed and enhanced, but continuously scanned and updated automatically and in real-time. or businesses like yours on Search engines and Maps.